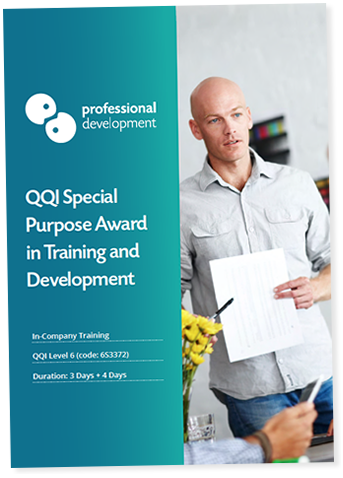 The QQI Special Purpose Award for Training and Development is very popular with our clients as an in-company programme for continuous development. In completing this 8-day programme, your team will gain depth of understanding and confidence in implementing all aspects of the Training Cycle. We can adapt the programme content to address the needs of your business or participants. Delivery of each module is also flexible, giving you the freedom to hold training at a time that suits you. What are the Benefits of Running a QQI Special Purpose Award at your workplace? By choosing to run this QQI Special Purpose Award training at your business, you’ll gain the ability to choose a delivery format that works best for you and your team. The award is comprised of Training Needs Identification and Design (3 days) and Training Delivery and Evaluation (5 days). You can run the programme as 8 consecutive days, or by taking a break between modules. Each participant on the course will receive a detailed level of training in all skills required for training excellence. Training Needs Identification and Design focuses on the first stages of the Training Cycle. Your team will learn to identify a client or colleague’s training needs through Training Needs Analysis. They will learn how to use the information to design the right training for the individual or group. Training delivery is such a huge part of a trainer’s role. During the Training Delivery and Evaluation workshop, we work on developing training delivery skills. Participants will receive valuable feedback from our experienced trainer. The final stage of the training cycle - evaluation - is an important one. For the benefit of both the trainer and trainees, there must be a way to determine how successful and useful the training has been. Methods for evaluation are covered in the final stages of the Training Delivery and Evaluation module. Successful participants will achieve the QQI Special Purpose Award in Training and Development. This is placed at Level 6 on the National Framework of Qualifications (NFQ). Here is a brief outline of the topics covered in each component of the QQI Special Purpose Award in Training & Development. Download a brochure to receive full course details. What is the process for achieving this QQI Special Award? When both components and their assessments are completed successfully, the QQI Special Purpose Award in Training and Development is achieved. Participants must attend the training and then follow a period of study and assessment work. 8 weeks after the course is completed, all assessment work must be submitted for grading. Once the grading process has been completed, successful candidates will be put forward for the award. We recommend running this programme in organisations with large HR departments, or businesses that have a need to deliver training on a regular basis. For example, many clients that regularly train new employees host this as an in-company programme to develop a skilled team of in-house trainers. I want to achieve this award, but don’t want to organise in-company training. Is this possible? Yes, we offer public course dates for this QQI Special Purpose award. Click here to get full details, and request our current schedule. You can click below to either ask us a question or request your in-company quote. If you’d like to speak with one of our training consultants, you can call us on Freephone 1800 910 810.